With the return of Sidney Crosby and the MVP caliber play of Evgeni Malkin dominating the Pittsburgh Penguins headlines, Marc-Andre Fleury has been under the radar. Once again another season is going by with the Flower not receiving enough credit for his brilliant play between the pipes. Marc-Andre Fleury has continued to improve each and every season. He looks more comfortable in net and has such a calming influence on the rest of the Penguins players. It is no secret that defense wins championships, and despite the luxury of having two of the most talented offensive forces in the world, the Penguins will go as far as their netminder, Fleury, will take them. This conversation seems to arise every season. It is about time that the Flower receives some credit for his magnificent play, and I will continue to write an article every season until Fleury wins a Vezina Trophy. If the hockey writers who vote on the Vezina for the NHL’s top goaltender do not vote to give Fleury the Vezina Trophy they should lose their voting privileges. There has been plenty of chatter about Henrik Lundqvist and Pekka Rinne as the top two Vezina candidates in the 2011-12 season. What the voters need to keep in mind is that the Penguins main focus is not centered on defense like the New York Rangers and Nashville Predators who Lundqvist and Rinne anchor in the net. The Rangers and the Predators play a very structured defensive style game. The Rangers are 3rd in goals against average while the Predators are 9th. The Penguins defense has declined since last season and has seen some of their highest paid and best defenseman struggle for the majority of the season. The Penguins team defense has slipped from 2.39 goals against per game to 2.56 goals against per game. Teams like the Predators and Rangers make their goaltenders their focus. These teams’ first concerns are minimizing the other teams’ scoring chances first and then playing offense. The Pens do not need, nor do they worry about this type of issue with Fleury in the net. Despite the lackluster team defense, Fleury has been the backbone and fooled many around the league into thinking the Pens won a variety of games handily. 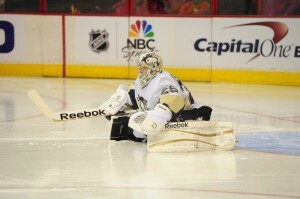 When in actuality, the Flower has stood on his head all year long and displayed more magical saves than one can count. Fleury has won more than 35 games in his past 4 seasons, including 41 wins this year with the offensive oriented Penguins. The Flower’s 41 wins leads all of the NHL. Fleury has played in six fewer games than Rinne who has also registered 41 wins this season. The reason why Fleury is worthy of his first Vezina trophy is because the Penguins put offense first whether they want to admit it or not, and why wouldn’t their focus be on offense with the fire power they have at their disposal. The Penguins are atop the NHL in scoring cashing in an average of 3.25 goals per game. While the Pen’s offense has been lighting up the rest of the league, there have been plenty of instances when Fleury has been hung out to dry. I could easily throw together a highlight reel of sensational saves Fleury has made this season that no other goaltender in the NHL has the ability or quickness to make. 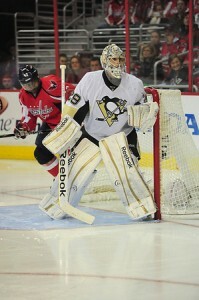 The Pen’s have depended on Fleury and asked him to play in more games this season than any previous year. This is due to the back-up goaltending for the Penguins being anything but solid. Brent Johnson has recorded three wins in 13 games this season. Brad Thiessen recently surrendered eight goals on 28 shots against the Ottawa Senators Saturday night. Fleury has had more pressure to win games this year than ever before. He has been the most successful goaltender in the NHL recording wins this season and has been victorious in 65% of his games. Fleury also has the fewest regulation losses of any goaltender who has participated in more than 50 games this season. With the Stanley Cup Playoffs right around the corner, the Flower has been at his best. At one time the Penguins trailed New York by 12 points and are now within one point of stealing the number one seed away from the Rangers depending on the outcome between the Rangers and Minnesota Wild Tuesday night. The Flower has won 22 of his last 28 games in the crease with only 3 regulation losses in that span. In addition, Fleury has two streaks of 9 wins in January as well as March. Before playing the New York Islanders Tuesday night, Fleury has only surrendered more than two goals in 10 of his last 12 outings. In the other two games Fleury only gave up three goals with one of those contests resulting in a win and the other an overtime loss to the Philadelphia Flyers with 0.9 seconds remaining in overtime. We have come to a point each season as to why Fleury should win a Vezina trophy. He becomes more deserving each season he suits up the pads for the Penguins. The Flower has received plenty of criticism since he was drafted number one overall by the Penguins in 2003 and all Fleury has done is thrive under the scrutiny. When is Marc-Andre Fleury going to receive the credit he deserves? This is the year Fleury’s name should be engraved on the Vezina Trophy. It is more than just Fleury’s ridiculous stats. He has made saves that Pekka Rinne and Henrik Lundqvist dream about at night. Ask any Penguins player or any Penguins fan and no one has more confidence in Marc-Andre Fleury than now. This is why the Flower should get his hands around a Vezina Trophy in Las Vegas this summer.